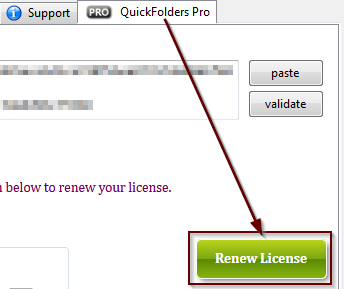 QuickFolder Pro users: If your license is expired there will be renewal links and buttons in the application. Using them you can buy a new license at a reduced price. Support the future development of QuickFolders and save money while enjoying unlimited Premium Features. The Renewal can only be bought by clicking the [renew license] button on the QuickFolders Pro tab in the Options dialog. For Renewal of a Domain license please contact me directly. Premium features are power functions which are an incentive for users to regularly support the QuickFolders project through a yearly contribution, called QuickFolders Pro license. My aim is that instead of very few people trying to carry the project with sometimes large donations to try involving more supporters. It is a lot of work to keep the project going and up to date with all the latest code changes which happen every 6 weeks on the Mozilla code base. Staying in sync with the three complex applications (Thunderbird, Postbox and SeaMonkey) and to support multiple OS platforms (Windows, Linux and Mac) and 18 languages, writing support emails and fixing bugs is actually a big amount of work. I would rather actually spend more time on this than just burning away my weekends, but for this it needs to be financially viable. See the support page on how to obtain a licensee. Here is a list of Premium features that are unrestricted to licensed users. quickMove Allows moving mail to any folder by entering one or two letters (part of the folder name). This is very useful when we have lots of folders. Drag the mails to the quickMove button and then start typing. Hit ESC to hide the panel. Right click for more options and a list of messages lined up for moving. quickCopy (4.2) Same as quickMove, but use for copying mail. Hold CTRL when dragging the mails mails to the quickMove button and then start typing. With the Premium version you can also use and configure a keyboard shortcut - by default this is SHIFT+T. quickJump Similar to quickMove and using the same button, click the quickJump button and type a folder name to go there immediately. hit ESC to cancel. Future versions may use a keyboard shortcut for this. Autofill last folder Enhances the quickMove / quickJump functions by automatically filling with the last successfully used folder name. The name of last folder successfully navigated by quickMove / quickJump will be inserted in the quickMove search field automatically. In most cases, through generating a unique single foldere match you can just hit [Enter] to repeat the move mail action or jump into the folder you last moved mail to, or simply type over it to go to a different destination. You can also use the "Slash" character for selecting subfolders that have the same name - e.g. "AC/bills" to select Account1/bills will expand to "Account1/bills" after using quickMove / quickJump and then used in autofill to avoid selecting "Account2/bills" "Customer1/bills". This new button makes navigating the unread emails a breeze. No time to look at your social media subscriptions, you just want to move on to the next important unread email? Simply click this button and jump onwards. Only when everything else is done, hurray, watch the next video or read the next tweet! With QuickFolders Pro, you can also activate a keyboard shortcut to execute the skip. To get started, you can download a selection of (16px2) icons here: http://quickfolders.org/downloads/quickFoldersIcons.zip - these are mostly favicons from websites but also some of the fabulous fugue icon set by http://p.yusukekamiyamane.com/. These are shared under fair use there I not own or transfer any rights for re-using them. For creating you own from any website, navigate to http://www.google.com/s2/favicons?domain=websitename - simply replace websitename with the URL of the site, e.g. youtube.com. With the free version of QuickFolders, the number of icons is restricted to 12. "Reading List" Icon for storing bookmarks for important mails. Drag an email to this button and QuickFolders remembers it for you, without having to keep a mail tab permanently open. Hold down SHIFT while clicking to open a new window, and hold CTRL to open a new tab for the email. Right-click any entry you want to remove. To test drive this feature, the free version allows adding up to 5 of these. 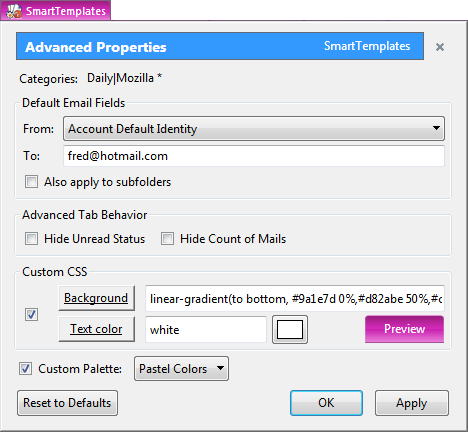 Setting default To Email address and From Identity for creating new mails when in a folder makes it easier when we store email from different identities in the same mailbox (e.g. Local Folders). For example: You can now configure your desired sender identity for each of your mailing lists. Or select a default recipient for when you write a new email from a folder. Using the quickJump / quickMove functions - create child folder command. Enter parent folder name (or partially) then press the forward slash key [/] to type name of the child folder. You know that you support the project and that the development and support will be continue. There is a huge amount of work involved not just programming and keeping QuickFolders up to date but also supporting users, coming up with better ways of doing things, fixing bugs, and keeping QuickFolders usable across various platforms and host programs (at the moment we support Thunderbird, SeaMonkey and Postbox). I am constantly helping people with using QuickFolders and their mail program and how to get the most out of email on the desktop. The donation screen (which is normally shown after an Update) is hidden. There are quite a few software developers (and also some users) who believe that software should generally financed by advertisement or even by selling user information. I am firmly opposed to this way of making money as it impacts both productivity and privacy rights; also in the world of Email I would find this way of generating value deeply problematic - even if it was strictly opt-in. There is a lot of personal information in our daily mail and a lot of knowledge that is being stored and retrieved with this powerful tool. One of the reasons for a personal Email Client on the desktop is the fact that we can store our data on our personal hardware and use it any way we like. On the other hand, if we use a web mail client (like gmail) we can never be sure whether the information is used otherwise and whether we get targeted with distracting information (be it by injecting advertisements or via targeted advertisement emails) - it is one of the goals of any mail desktop client to eliminiate these distractions as much as possible, and focus on one thing only: managing communication. QuickFolders is an especially powerful set of tools to harness this information and it will evolve and keep saving time and make your experience of mail more meaningful and intuitive. For questions or comments not about a specific project, please read our feedback page.